As you can tell from the photo, five new units are being built on the Bidston Moss Retail Park (near Junction 1 of the M53) on what used to be the site of MFI & Carpetright. There’s been curiosity about who will occupy the new units numbered 4A, 4B, 4C, 4D and 4E and some people have come to this blog looking for further information using the search “bidston moss retail park new shops”. The planning application (more details here) lists the mysterious Derwent Holdings Ltd on the Isle of Man as the applicant. The new units are currently advertised as to let on GVA’s website. So all that can be said about the new tenants is that they won’t be food businesses (as this type of business isn’t allowed with that type of planning permission). Hopefully the new units will be finished and let soon bringing desperately needed jobs to the local area. One of the four units is now occupied by Carpetright. One bit of good news surrounding the development is that a former car park on the site will be transferred to Wirral Council to be incorporated into Bidston Moss Nature Reserve. The developer of the units in Bidston, Derwent Holdings, is the property company controlled by Albert Gubay, founder of Kwik Save. Most recently they went to the High Court to try and prevent Lancashire cricket club redeveloping their ground into a test arena as they had rival development plans for the area. They failed. Well they seem to be having a hard time renting the three vacant units. Two have had reserved on for a good while now. Probably it won’t open until all five are rented, but there’s plenty of speculation as to what those two units will be. The legal battle had nothing to do with the sports arena. 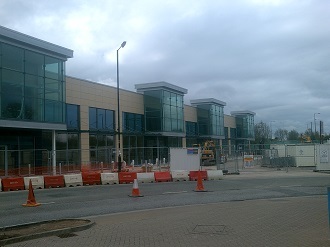 It was the planning permission to build Tesco and the dispute was with the council. Strange thing is, on the Day they submited plans a large Supermarket at the White City (already a retail park), plans were received and by the council for a supermarket where Tesco has just been built. Strange how both sets of plans were submitted at the same time! Could it have been inside information from within the council! Tesco were directly funding the the redevelopment of the cricket ground (a private concern) if planning was granted to them. In the end the cricket ground gets built & a few toffs get to watch test matches! On the other hand the charitable trust which is to distribut profits made by Derwent Holdings will be hit due to them not getting rent revenue from a supermarket. I’m sure Bidston retail park will be a success if the local council don’t hinder things. I’ve not seen the project but it’s looking good from this picture. Some of Gubays sites doo look a mess, but once developed look very well indeed. I’ve heard he has a 50 year plans for Bussiness in the NW. So he’ll be 135 when alls complete!!! It would be great who ever owns this land at Biston Moss would get the bloody road fixed,[ near entrance/exit ] its been like this for years and i am amazed no one has died there yet. I passed where you describe today. It’s not Wirral Council but whoever owns that shopping complex, I think the name of the company is on the planning application. The bit on the left side could do with a resurface yes.